Where do our students’ ideas go as they get older? What stops a 9 year old from expressing an idea compared to a 5 year old? Why do we see smiling and play in a 5 year old, but a 9 year old shows an indifference towards anything creative? Take a look at this comic. An enthusiastic idea coming from Calvin. I do wonder what it would be like if Calvin were sharing his idea with his peers compared to Hobbes. Would he still be as enthusiastic? What would he be willing to share? Today I had a student tell me they just wanted to go home while we were exploring using Google Expeditions. A comment that stung me as I heard it and kept pulsing throughout my brain the rest of the day. I try to work with students to empower them to explore, ask questions, create, and share… that comment shook me. We have to look to our students for ideas and give them choice. Our education systems need to show each individual that their ideas are worth sharing, valued since those ideas will change our world. I felt that with the chance to explore students would be asking questions and they were, yet this student felt inclined to not share. Our classroom culture values ideas and thoughts, but sometimes students have been fed the same line for years before that their ideas aren’t worth it. It’s a completely different climate and culture when they step in to our room. We use puzzles and codes to work through questions, create with Bloxels to retell stories, build with Tinkertoys and Lego as we explore Mars, and the list goes on. As I thought about the student’s comment this evening, I thought maybe they had experienced times in the past where ideas were blasted a part. Maybe the student is experiencing fright when we explore. I’ve felt that way before and the realization hit me that we are all on a continuum of exploration, moving fluidly as each day comes and even each question they ask. We must provide an environment where ideas are shared, not as a possible outcome, but as one of the major outcomes. Ideas are what change the world and like Calvin did with his thinking cap, (sharing his idea), our students should do the same. I believe that the student who said they just want to go home wants to be creative. What I have seen from that student throughout our time together shows me an individual who succumbs to the pressure of peers and adults telling her that she’s wrong. My goal for the rest of the year is to bring each individual student the opportunity to express their ideas without judgement. Students don’t need praise on every idea they share, but they do need questions. Where do we provide opportunities for ideas to be shared? When do we value our students’ ideas, when it’s right for us, or important to them? I pledge to bring more opportunities for those students who have felt burdened with sharing ideas, as if it is a horrible thing. What is horrible is the way our culture sometimes implies that we need to be quiet, our ideas aren’t worth anything to others. I felt that when I was younger. My voice wasn’t necessary. Ideas that bounced in my brain weren’t needed. As I have grown, I realize that all ideas have worth and value. It’s what stays inside our brains that can be innovative, but without sharing and collaboration will never get better. We must provide an environment where ideas are shared, not as a possible outcome, but as one of the major outcomes. Strive this week to encourage sharing of ideas through puzzles. Use matchstick puzzles for students to share their thoughts and methods. 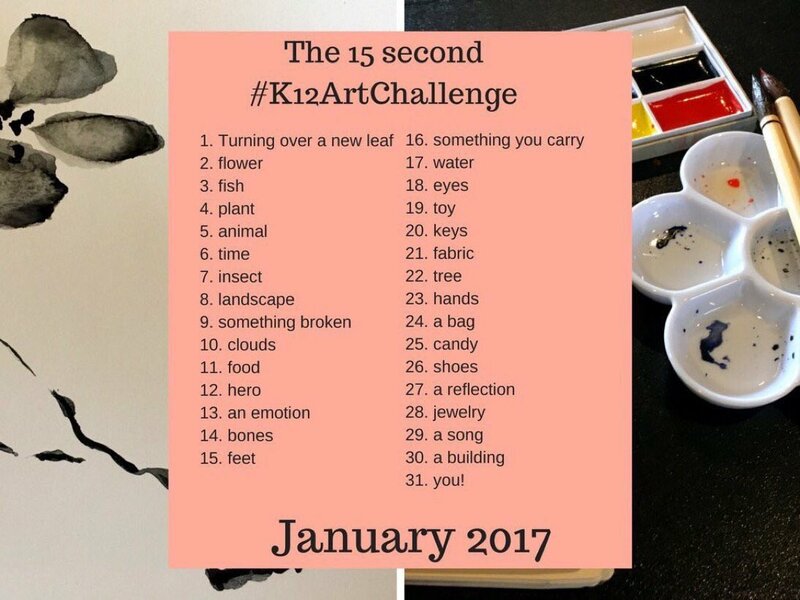 Do an art challenge with your class like the k12 art challenge did this January. Whatever it is, have students share, ALL students (even you). Adults are students too and if we don’t share what will our students think? Value ideas as if they were the most precious material in the world. Value our students. Value our learning. Value the thought process. Next Post Wow! Thanks for sharing that Mistake!